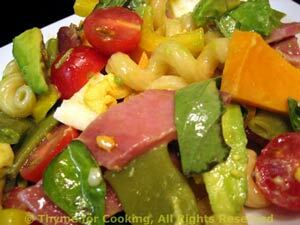 Easy Dinner from Thyme for Cooking: Cobb Pasta Salad, with Ham. I've decided that any lettuce salad can be converted to a pasta salad. Since the season for lettuce is rather short, this theory works well for the rest of the summer. No barbecue grill needed for this meal.